The world of Polemachus, normally a planet that revels in combat and bloodshed, is for once at peace as it prepares to celebrate the ascension of Lord Arkon to the throne. Arkon, however, is preparing for a day of hunting. The Lady Thundra asks him if he is planning to do this before or after the celebration. Arkon sighs and begins to tell her that the endless speeches bore him to tears when the Vizier interrupts with news of that the city is under attack. Thundra and Arkon run to the balcony and look into the sky. Above them they see a swirling black mass and two glowing eyes. Just as suddenly a voice demanding to know what "the secret" and "truth" is invades the minds of the citizens of Polemachus. When it does not receive an answer the world of Polemachus dies and the universe dies with it. In the Anti-Matter Universe of Qward the Weaponers of the planet find themselves under attack by the Crime Syndicate of that universe's Earth. As the attack progresses the same eyes appear and the same mental demand for the secret and the truth invades their minds. Qward and the Anti-Matter Universe suffer the same fate as Polemachus as the Crime Syndicate and the Weaponers die in a wave of energy engulfs him. En Dwi Gast, also known as The Grandmaster, watches as a young planet forms below him. Suddenly the Elder of the Universe he senses a voice in his head, which is actually a broad-spectrum energy probe for answers. The Grandmaster demands that whoever sent the probe to stop since it threatens the very fabric of the universe. He also demands to know who the being is and what the being wants. The probe pauses and shifts before forming itself as a humanoid. It tells the Grandmaster that it seeks the Ultimate Truth and that its name is Krona and he will not be denied. One month later in another universe the JLA battles an armored giant on the outskirts of Keystone City. The giant lands a solid blow and sends Superman flying. Aquaman informs the group that they are barely making a dent and if they don't do something soon the West Keystone Medical Center will fall. J'onn J'onnz, the Martian Manhunter, attempts repeated telepathic scans, but the being's armor frustrates him. From a distance Plastic Man tries to coax Batman into action, but the Dark Knight simply watches and schemes. Finally the creature speaks and calls itself Terminus. It also demands that all bow before him or die. To prove his point he unleashes and energy bolt from his staff, which Superman blocks. Batman finally realizes that the power of Terminus is in his staff. He orders J'onn to link the team telepathically. Once he has the group "on channel" he coordinates the team in repeated assaults on Terminus. Terminus tells the group that he knows they seek to separate him from his staff and begins to inform the group that this is impossible but is stopped by a powerful telepathic assault by the Martian Manhunter. With Terminus distracted Batman calls his true plan into play. Green Lantern caps Terminus' staff with an energy construct that analyzes and then turns the staff's energy back on Terminus. Terminus falls and the Justice League stands around him, wondering where he came from. Suddenly, the Spectre appears and takes Terminus away, telling the Leaguers that he does not belong to this world. The JLA is momentarily distracted, but Wonder Woman tells them that there are people to help from the attack and the group goes about its job. Meanwhile, in the New York City of the Marvel Universe Starro the Conqueror rains down his probes onto the populace. The Avengers are on the scene, but some of their members, including Yellowjacket, She-Hulk and Triathlon, have been taken over as well. While Captain America, Wasp, Warbird and Scarlet Witch try to contain the ones who are controlled on the ground Thor, Iron Man, Vision and Jack of Hearts try to attack Starro itself. The Vision tells the group that a new strategy is needed before even the mightiest of the Avengers falls to the alien's control. Suddenly one of the drones takes over Thor. Quicksilver breaks through the ground ranks of the Avengers as Thor attacks the members on the air. Warbird manages to snag Quicksilver and they manage to take the star off his face. He tells them of his experience while he was under the Star Conqueror's control, mentioning that it wants tides of order to spread across the world. These words give the Vision an idea. Under the protest from his fellow members, Vision takes the drone and places it on the Scarlet Witch's face reasoning that since her powers derive from chaos magic that it would help defeat the creature of order. His plan works and the Star Conqueror takes off back into space. The group recovers and after the Vision receives a message from Quasar they regroup at Avenger's Mansion. Quasar tells the group that strange invasions are occurring all over the universe. The Shi'ar Empire reports a strange being, who is really Lobo, decimating its Imperial Guard. Other more ancient races are being invaded by unknown aliens, such as the Khunds, as well. Quasar continues by telling them that his Q-Scans are telling him that the invaders are from another universe. While Thor and Captain America deal with the clean-up of Starro's attack Jan and Iron Man begin to form a plan for the next possible attack. Elsewhere, the Flash uses a chunk of Terminus' armor to home in on where he came from. With great difficulty he succeeds and finds himself in a sleepy river town. He attempts to do a wideband molecular scan when a cry for help catches his attention. He turns to see a mutant being chased by a bloodthirsty mob. He tries to help and manages to help the kid escape, but when he tries to do the same he trips, discovering that there is no speed force in this universe. His powers gone, the Flash is powerless as the mob descends on him. Back at the Watchtower the League waits for the Flash returns and watches images from across the universe. On the planet Thanagar Skrulls invade while Mongul fights off the Brood. Wally returns, beaten and bruised, and tells them of the angry mob and how the only reason he escaped was that with his powers gone his vibrational rate returned to normal and he popped back into Keystone City. Before he could continue the master alarm goes off as the Martian Manhunter announces that they have a visitor. Plastic Man spots the visitor as the giant Watcher hovers over the Watchtower. The Manhunter performs a telepathic scan, but only receives an odd sense of curiosity. Before the League can focus on the Watcher Superman senses another intruder. The Grandmaster appears before them and informs the heroes that the Watcher rarely acts but prefers to observe and record. Green Lantern surrounds the Grandmaster with a construct cage before Superman greets the Elder on behalf of the Justice League and asks what brings him to this world. The Grandmaster replies that he is from the same universe as the intruders they have faced and since he does not like to see contests uneven he has come to tell them of the peril they face. Superman asks J'onn if the Grandmaster is telling the truth, but the Manhunter tells him that he cannot reach into the mind before him, adding that this is beginning to annoy him. Wonder Woman suggests they use the Golden Lasso of Gaea. The Grandmaster concedes to this idea. The Grandmaster informs the League that the barriers between their dimension and the dimension where there intruders came from have been deliberately weakened. To prevent this damage twelve items must be assembled. To emphasize the point the Grandmaster displays a visual of the items. Six of the items, the bell, wheel and jar of Abnegazar, Rath and Ghast, the Medusa Mask of the Psycho Pirate, the mythical Spear of Destiny, the Eternity Book, the Orb of Ra and a Green Lantern battery the Leaguers recognize. The Grandmaster explains that the items they don't recognize are from the other universe, but they are equally as powerful. Failure to assemble the items will mean that a universe will die. He then places the locations of the items in their minds and warns that others will seek the items. Before they can question him further the Grandmaster disappears, leaving the JLA to wonder the validity of his story. Wonder Woman tells them that according to the lasso he was telling the truth. The League decides to travel to the other universe and investigate. Since the Speed Force does not exist in that universe the Flash decides to stay behind. A very enthusiastic Atom takes his place and with great effort the Flash helps the group travel to the other world. Meanwhile in Avengers Mansion Iron Man uses data from the Star Conqueror to rig an early warning system for beings breaching the dimensional barriers. Captain America enters the room with Hawkeye, who has answered the call to all Avengers reservists. Suddenly the alarm Iron Man created goes off as the JLA enters the Marvel Universe. The JLA splits up into teams under directives from Batman to observe and not get involved. Green Lantern and Aquaman visit Doctor Doom's home of Latveria. Wonder Woman and J'onn J'onnz travel to the wasteland of Genosha. Superman watches the aftermath of the Hulk's rampage in Michigan while Batman and Plastic Man watch the Punisher taking down a group of drug dealers in New York City. Plastic Man begins to tell Batman about his distaste for drug dealers, even when he was a crook but Batman decides to break his own rules and get involved. After the League regroups Plastic Man chastises Batman for his indiscretion and wonders why when he told the others to stay impartial he decided to go at it with the Punisher for twenty minutes. Green Lantern agrees with Batman and wonders if they should have gotten involved. The Martian Manhunter concurs with Kyle, but thinks that they should stick to the original plan and get the artifacts so they can save their world. Superman on the other hand is not happy. He wonders if there are heroes on this world why they don't do anything about the misery going on around them. His anger silences the group with only Plastic Man to ask if Superman is okay. Superman replies that he doesn't trust this world and that they should find the artifacts and leave. The next stop is an island in the Sea of Okhotsk. The League finds out quickly why they call the rock Monster Island when Fin Fang Foom and other monsters attack. Wonder Woman directs Batman to make a break for the item while they cover him. The battle ends and Batman emerges with the Ultimate Nullifier. J'onn examines the item, but it threatens to overwhelm his mind. Superman tells J'onn to stop his probe, but the situation is taken out of their hands when an arrow fired by Hawkeye grabs it out of his hands. With the JLA distracted Captain America orders Iron Man to fire his pulse cannon. The beam hits the League, but not before Wonder Woman grabs the arrow. The League finds themselves back in their home universe. Aquaman is miffed that they were cast out so callously. Green Lantern agrees and Plastic Man suggests that they go back. Batman tells them no, that they have what they want and there is no need to fight if there is no point to it. Superman rather darkly says that there may be more of a fight than they think. There are five more items on that world that they need to retrieve. Superman goes on to say that from what he has seen of that world's heroes he's not impressed. Not with their world or achievements. He suggests that they head back to the Watchtower adding that the artifact they have is bad enough and if there are more like it the situation could be unthinkably dangerous. Back on Monster Island the Avengers discuss how the invaders escaped. Suddenly the Vision interrupts, warning that they are being watched. The group investigates heading towards a cave, but as they enter they find themselves bound in a yellow force field, even the intangible Vision. Hawkeye wonders if it is a trap the intruders left behind, but Captain America doesn't buy it. The being responsible is revealed as Metron introduces himself. Quicksilver demands to know exactly who he is and what his comrades want with the Ultimate Nullifier. Metron tells him that the intruders were not his comrades and the Nullifier was only the beginning. He reveals that the League also seeks the Soul Gems, the Casket of Ancient Winters, the Evil Eye, the Wand of Watoomb and the Cosmic Cube. Metron warns that the League must be opposed for if they succeed in their quest their universe will die. From a distance the Atom, who stayed behind, watches and wonders why Metron is lying. To help the Avengers Metron gives them a Mother Box. Iron Man examines the living computer, which bonds to his armor. With that Metron leaves. Cap orders Quicksilver to follow, but Metron is faster. Iron Man informs the group that with the Mother Box he can get them where they need to go. In Metropolis Loophole and his gang finish a successful bank robbery when the Avengers arrive via Boom Tube. Loophole orders his group to kill them, but the Avengers make fast work of them. After the battle a crowd descends on them, wanting autographs. Cap tells the group that they don't have time for this and orders Quicksilver to scout around while the rest of them move out. Soon, Quicksilver rejoins his comrades and the Avengers are stunned at how the people of this world idolize their heroes. Captain America declares that he doesn't like it. He claims that this isn't justice and that the "heroes" of this reality own the world like a tin plated gods. He asks his friends if they feel it as well. Before they can answer or respond to Cap's odd behavior the Justice League arrives and demands that they leave. Hawkeye muses of how the League is nothing but a bunch of Squadron Supreme wanna-bes and that they are probably being mind controlled. Superman, meanwhile, demands that they stand down to be taken intro custody. Cap tells them that he knew they were fascist overlords and this confirms it. Members of both teams question their comrade's odd behavior. Meanwhile Thor decides to take matters into his own hands. He informs the League that he has had enough and calls his friends to arms. He then hurls his hammer at Superman. Mjolnir connects and sends Superman hurtling into a nearby building. Elsewhere Metron and the Grandmaster meet and discuss their plan. The Grandmaster is quite pleased that the two teams are playing the game of his devising. Metron informs him that Krona has no intention of abiding by his rules. If Krona wins he will claim his prize. If he loses he'll do whatever it takes to gain what he seeks. The Grandmaster agrees and concedes that in the end both universes may die, but this was the only way to delay him and buy some time. From a hidden point in the room the Atom watches in disbelief as the Grandmaster tells Metron that he also hopes that for the sake of two universes Krona does not discover that the Grandmaster is simultaneously playing a deeper game. Story - 5: You know, this comic reminded me a lot of Freddy vs. Jason. I was really looking forward to Freddy vs. Jason. As a fan of both series of films I was petty jazzed to see how they were going to link the two into some kind of comprehensible story. Overall I was very happy with the result, mostly because I was happy with how the battle between the two went but also because the people behind the film managed to capture the essence of each series while maintaining an identity of its own. There was the sometimes over the top and barely clothed kill fests of the Friday the 13th movies with the creepy, cat scare tone of the Nightmare on Elm Street movies. It could have been a fiasco, but it worked. Crossovers are a tough sell. I mean on the surface they make perfect sense, but the hype sometimes writes checks that the actual product can't cash. With the sheer number of crossovers that were published in the '90s it almost seemed like there was a revolving door between the comic book universes. Some were good, like when the Silver Surfer and Green Lantern met. Some were best left undone, like when X-Force and Youngblood met. (Some things you can't un-see.) With so many books of this nature coming out it almost took the fun out of it. I mean how special is it when Batman and Spider-Man meet when stuff like that is coming out on an almost monthly basis? So what separates JLA/Avengers from that lot? Well for one thing Kurt Busiek was one of the main players at the helm. Busiek is that special kind of writer that blends fanboy enthusiasm with a solid sense of characterization and plot. He is the perfect writer for this kind of project because outside of having an almost Mark Waid level knowledge of comic book lore he is also one of the few writers currently working that has written both series. He has a brief stint on Justice League of America back in the '80s and he had a critically acclaimed re-vamp of Avengers back in the late '90s. This man knows both teams. He knows how they tick, which right away tells you this is the man for the job. Outside of that Busiek has such a keen insight into the differences between the two teams and universes and how they work that he has crafted what might be the most realistic crossover in comic book history. Usually when two heroes from different universes meet there is the obligatory battle before the two team-up to defeat the bad guy (or guys) to save the world. This isn't a bad thing. Often the stories are enjoyable, but because they are usually one-shots there isn't a lot of time to delve into how the characters would really interact. The fundamental differences between Marvel and DC kind of dictate that while these heroes may have the same calling the worlds they live in cause their outlooks to be very different. The Marvel Universe is kind of a dark place. I mean there are bright spots, but between the bigotry towards mutants and the fact that most of the personal lives of the heroes are generally in the toilet things are not always a bed of roses. I mean look at the typical love life of a Marvel hero and you have years of therapy ahead of you. Because of this die-hard Marvel fans will argue that the world of the X-Men and the Avengers is more real. Most of the weaknesses of the Marvel heroes are internal and their problems more relevant to the reader. Also the general public tends to fear their heroes more than they trust them. DC on the other hand is a pretty bright spot in the comic book world. The public is more trusting, the personal lives a bit more stable and there is more of a sense of heritage than the Marvel heroes. The heritage angle has more to do with the fact that there is a generational aspect to the DC heroes with the clear lines between Golden-Age, Silver-Age and Modern Age. DC fans tend to be into the characters themselves with all other aspects being more of a McGuffin. (If I am getting this right, a McGuffin is a term Hitchcock coined. It is the thing that the characters in the piece are concerned with but the audience cares little or nothing about. I could be wrong and don't mind if I am corrected.) Most DC fans don't care about the plot of the piece, just how their favorite characters are going to react to it. So through Superman and Captain America we get to see what heroes from one universe might think of another. Superman and Cap are the perfect choices for this exercise. Captain America is a soldier. He is who he is because he answered a call when his nation needed a hero. He doesn't do it for the adulation. In fact they are an anathema to him. Of course we are talking about a character that drew the comic book based featuring himself, but that's beside the point. Superman is more of a cop. This isn't a bad thing, but it's more of an apt description. His deeds come from a calling and an overwhelming need to make the world a better place. He doesn't shy away from public accolades mostly because of the overall good it might do. He doesn't like it, but seems to believe it is part of the job. Cap would look at the DC Universe and see a world of heroes that demand to be worshipped. Superman would look at the Marvel Universe as a project, another world that needs saving. By doing this Busiek manages to say what he wanted to say without shoving it down our throats. Of course I get the feeling that their respective senses of outrage have been amplified by an outside source, but that's only because of the reaction of their teammates when the two heroes wigged out. Beyond the deeper themes that the series is exploring there is a lot of fun here. It's been awhile since there was a good universal calamity for the world's mightiest heroes to deal with. Unlike DC vs. Marvel/Marvel vs. DC there is more of a believable threat than two cosmic brothers who just noticed each other. (No offense to writers Ron Marz and Peter David.) I mean Krona, the Grandmaster and Metron. These are heavy hitters and it makes the whole thing a lot of fun. The little character touches were great as well. The serious Crisis vibe at the beginning with the dying universes right down to the Crime Syndicate biting it and Krona being involved somehow. Lobo taking on the Imperial Guard. The Brood attacking Mongul. Batman ignoring his own directives to take on the Punisher, which happened off screen to my disappointment. The Martian Manhunter's annoyance at his inability to get a "read" on anybody. All of these bits made for a really fun read. And let's not forget the best line in the entire book. "Oh right - Now I got it! These losers - They're nothin' but a bunch of Squadron Supreme wanna-bes! Five gets you ten they're mind-controlled!" The most obvious line and Hawkeye was the perfect character to say it. The thing that surprised me the most was the fact that I had no problem with Thor laying out Superman like tomorrow's clothes with his hammer. It was the perfect opening shot to a fight I am really looking forward to. Yeah, a slug fest is somewhat clich�d, but come on. These two have to fight, at least once. Deep down this is what we all paid the admission for. God, I can't wait for next month. If there was anyone who was born to draw this book, who has earned the right to draw this book it is George Perez. Time and again he has proven himself a master at taking a large number of characters and bringing them together while also giving them all a distinctive look and feel. Your average artist tends to make the masked characters look the same and the body types tend to be uniform. Perez doesn't do this and that attention to detail makes him to be the master that he is. Some of the highlights include his take on the Crime Syndicate, the two page spread of the Avengers battling Starro, the two page spread of the JLA hovering above the Avengers and the splash page of Superman eating Thor's hammer come to mind. You can just stare at this artwork all day long and it is still breathtaking. The sad thing is that as much as I like his artwork I don't have a whole lot to say about it. I mean it's fantastic, but I would just tend to repeat myself, so let's just say that I think as good as this issue was the best is probably yet to come. Cover Art - 4: Okay, I just gushed about Perez's artwork and here I am giving the cover a four. Well, as much as the interior art was fantastic I really thought the cover didn't really grab me as much as I thought it would. Maybe I'm being unfair. 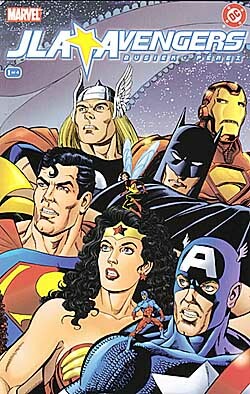 I still have that first image from about two years ago with the Avengers and the JLA standing shoulder to shoulder. It was epic and let you know that this was going to be cool. So I could be placing an unrealistic expectation on the cover. But the layout does very little for me, especially when Iron Man is looking in another direction. God I feel like such a fanboy.